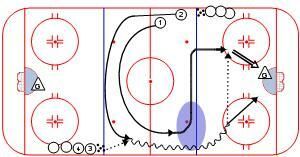 Simple 2vs0 drills to teach "Stretch Support"
"When the puck carrier control the puck without heavy pressure, SKATE AWAY FROM HIM/HER TO CREATE PASS LANES OR OPEN ICE FOR HIM". 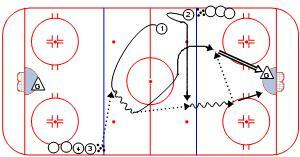 You can teach players various stretch support through simple 2vs0 drill like below. P1 and P2 leave the line to receive the puck from P3. 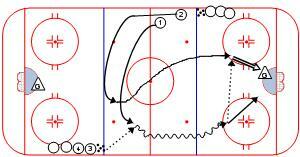 If P3 passed the puck to P1, P2 stretch wide for support. Enter AZ and take a shot. P3 and P4 start to the other end. If P3 passed the puck to P2, P1 cut across the blue line to create space behind him for P2 and stretch wide for support. P2 doesn't follow P1 but stretch out along the board, receives diagonal pass from P1 for attack. 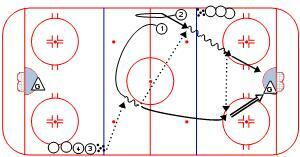 P1 stretch or follow to support P2 for pass or rebound. P2 doesn't follow P1 but move along the blue line, receives vertical pass from P1 for attack. This site is produced and maintenanced by Hiroki Wakabayashi. No copy or reproduction without permission.